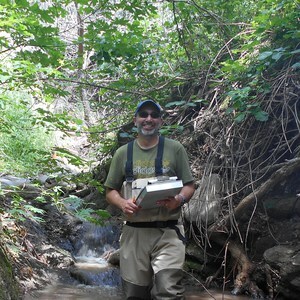 Freshwater Creek Bioassessments - Applied Marine Sciences, Inc.
AMS has been heavily involved in the design and implementation of freshwater bioassessments on behalf of public and private National Pollutant Discharge Elimination System (NPDES) permit holders. AMS has multiple staff members trained under the California Department of Fish and Wildlife (CDFW) bioassessment protocol, maintains an active training program, and participates in regular inter-calibration exercises with oversight by Surface Water Ambient Monitoring Program (SWAMP) personnel. AMS has conducted bioassessments on nearly 200 individual reaches in Alameda, Contra Costa, and San Mateo Counties. Monitoring activities have included collection of water quality samples and measurements, assessments of physical habitat parameters, collection and preservation of algae and benthic macroinvertebrate samples, quality assurance, and submittal of data to the California Environmental Data Exchange Network (CEDEN). AMS personnel have also been trained by CDFW in laboratory processing techniques and calculation of California Stream Condition Index (CSCI) scores to assist with data interpretation. AMS is also providing data analysis and interpretation for a five-year review of bioassessment benthic macroinvertebrate and algae data conducted on behalf of Bay Area Stormwater Management Agencies Association (BASMAA) stormwater Programs; this review encompasses over 300 individual sites sampled by the collaborating Programs.